The Pro-Tein Clean protein skimmer is a new take on a pretty standard piece of reef aquarium quipment. We all know everything there is to know about protein skimmers, right? You pump water in, mix it with air and capture the foam – simple. Sounds like child’s play, and for the most part that’s what they are, at least until some parameter in the system changes. For example the water level in the sump rises and the skimmer cup overflows dumping nasty wastes into the tank, or the water level drops via evaporation, and the skimmer stops working altogether. There are ways and means of ensuring these scenarios are prevented and dealt with but inevitably something changes and a mini disaster ensues. It is these issues however that the brand new “Pro-Tein Clean Skimmer” was designed to address. Its not everyday we hear a manufacturer or hobbyist state that “they have a revolutionary new concept for protein skimming” . . . it’s even less frequent that we agree. In this case though the Pro-TeinClean is a bit of a game changer. We recently got our hands on a review unit of the Pro-Tein Clean skimmer to put it thru its paces. This skimmer looks remarkably like any other skimmer out there on the market, so what is so revolutionary about this design, after all? On assembly of the unit, two things become apparent; one is the built-in internal siphon/overflow that resides in the barrel of the skimmer and the second is a rather ingenious air control system with a float valve actuator that resides inside the collection cup. 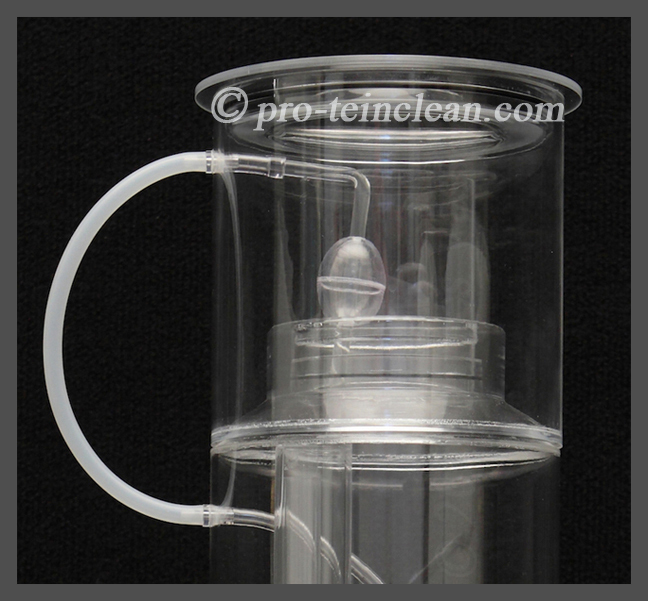 Assembly of thePro-Tein Clean skimmer is both quick and simple; within 5 minutes the working unit was ready for trials. As stated by the manufacturer, this unit will operate in any water level between 5 and 1 inch. Taking them at their word, the assembled Pro-Tein Clean skimmer was placed in a sump with 4 inches of water and turned on. Within seconds, the barrel was full of a frothy air-water mixture and within minutes a distinct foam was collecting. After an hour a steady head of foam filled the neck of the Pro-Tein Clean skimmer. Now, being curious as to the validity of the operating range of the skimmer (plus the fact we have never seen a skimmer work in one inch of water) the sump was part drained to approximately 1 inch. The Pro-Tein Clean skimmer was totally unfazed and continued collecting goop like a champ. As water was added back to the 5 inch mark there was no appreciable difference in the performance. Beyond the 5 inch mark we did manage to flood the collection cup, so attention does need to be paid to the maximum water levels. So how does the Pro-Tein Clean skimmer handle the rise and fall of the water level without going crazy? Well, the magic appears to lie in the air control actuator. The skimmer itself is a sealed system and as the water/foam interface rises this lifts the internal float valve which moderates the airflow. Coupled with the internal overflow this leads to a steady state where foam collects but water doesn’t overflow. Since the pump works at a constant velocity, drawing in both air and water, moderating the air flow also moderates the water flow, making it self-adjusting and removing the hassle of constant adjustments on the part of the operator as water levels fluctuate. The Pro-Tein Clean skimmer test model we have tinkered with has been in constant use for approximately two months. Initial concerns that foam and scum build up may impede the float actuator were soon dispelled and the skimmer has performed well. The ingenious use of filter plates at the base of the unit seem to eliminate all microbubble release, and at no point in our tests did we observe any bubble escape from the unit. Aside from routine emptying of the collection cup the skimmer requires minimal maintenance and is very quiet. As stated above, the skimmer is a sealed unit, air is drawn from inside the collection cup. This has the added benefit or minimizing the escape of water saturated air and thus reduces humidity inside the tank stand. Our test systems for this unit was an approximately 250 gallon system of a mixed reef. The foam accumulation was constant, and by simple adjustment of the actuator a wetter or dryer foam can be achieved. The design of the Pro-Tein Clean skimmer also creates a very small footprint making it ideally suited for size restricted sumps. All in all, a very simple and easy use to skimmer. For more information on this new design visit the manufacturers website where there are number of instructional videos demonstrating the performance of the unit.